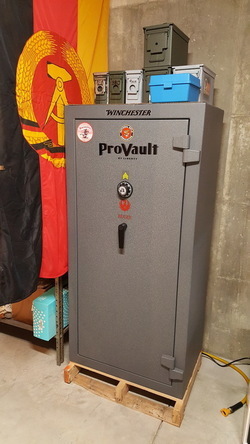 Well I got my Liberty safe (Pro Vault Model sold by Cabelas), and as most safes goes they will not hold what they say they will. 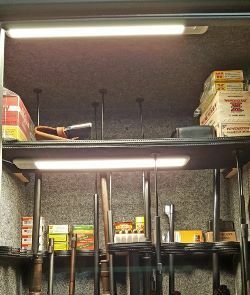 Also, I found that the plastic Velcro gun rods used inside of a safe make it very easy to obtain space normally that you would loose! I have also came to the realization that the bigger doesn't mean better, except maybe fire rating or access into a safe door, and then again safe doors are a subject all their own. Last but not least I believe the Golden Rod was a great purchase! Now, Onto the subject at hand...interior lighting. 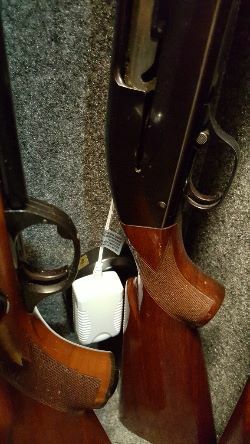 Now I am not real familiar with gun safes and the capability of electric inside of them by other manufacturers other than Liberty. I assume they have their own versions. 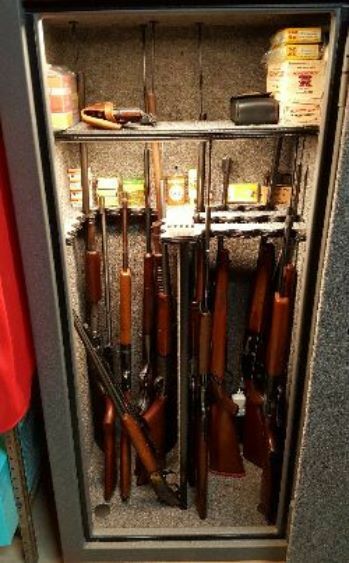 Nor am I familiar with gun safe lighting. I of course had a safe that was made to install electrical by being precut and blanked off in the event one wanted to install an electrical outlet kit. Again using the Liberty outlet kit is the only option. Very easy to install, well to anyone that has used a holesaw bit that is. Well a recent trip to Lowes after looking online to see what they had and wholla. They have LED undercabinet lights in 12", 18" and 24" lengths that are slim and flat. Spendy however! I decided what the heck, so I bought two 18" ones and installed them and wow! These particular lights are dimable, and motion activated. Mounted very easily with drywall screws that the pre made holes fit in perfectly. The other neat thing is they contain a preinstalled wire/plug allowing you to simply plug as many as you want in and using only one plug in the power outlet. wiring is thing and not bulky and was easily stashed inside the partitions for a clean install. OCD won't allow me to have anything sloppy, has to be neat and in order and dress right dress. So although I do not have pics sized to post, I will in a few days, what is everyone else utilizing? I did not want battery operated push stick on or mount lights cause they just don't have the light and battery's...ugh! Oh I also, got the bright idea to mount the motion detector, which is also the dimmer as well, where the door opens and closes, as it swings by it turns the lights off on closing and on upon opening! These things are da bomb! Okay so here are some pics I resized and hope they are decent enough to see what I done. Now personally I chose to leave her on the pallet she was delivered on. I initially took it off when I took into the basement (talk about a task), then thought "what if" power goes off, back up battery system/charging system goes down, and sump pump isn't pumping water...what then? At least this gives me a little time to get guns out as there are holes in the bottom where this pallet "was" bolted to the safe, and water will get inside the safe. Plus there is absolutely no way anyone can carry this thing out and up my outside stairwell in the event I am broken into either. Also, that is an original silk type East German flag I got in East Berlin before the collapse of the wall in Berlin. I left there in 1988, 1989 the wall came down. The safe looking inside with normal outside lighting. No inside lighting. Safe with 2 18" LED thinline strip lights installed. Let There BE Light! This view shows where the motion sensor/dimmer switch is mounted inside the safe. Worked out great as when you open the door, it moving turns the lights on, and when you shut it as it goes in front of it, it turns the lights off! All the wires from transformer to the switch, then to each light, are tucked away in the creases of the fireproof material of the safe so very clean install. YES, my OCD kicked in as usual! This view shows the power plugged in, and the only wire not tucked away is the first foot if this wire going to the corner and tucked inside the fireproof material again. This wire is 4 foot long so no issue running it to where you are gonna begin to mount the lights. 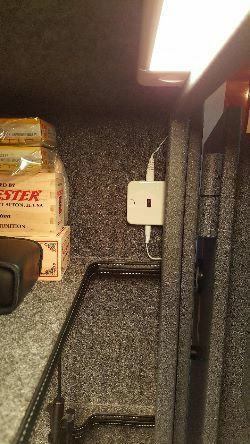 With a Goldenrod plugged in and the lights plugged in there is no room to plug anything else into the outlet, but the way I see it, it is a safe not a power strip haha! This view shows the two LED lights mounted. One in the very top directly above the safe door. The second is underneath the shelf. I didn't need the adjustable shelves/brackets so I removed those. 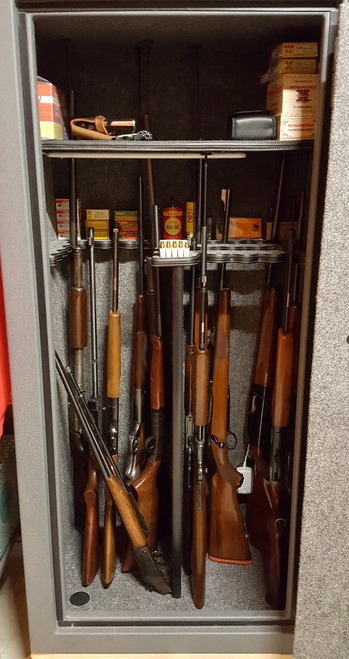 I realized that the plastic rods work outstanding in helping one to organize and utilize space within a safe.